An attendee speaks at a community meeting held by the African American Community Service Agency in San Jose (July 12, 2016). 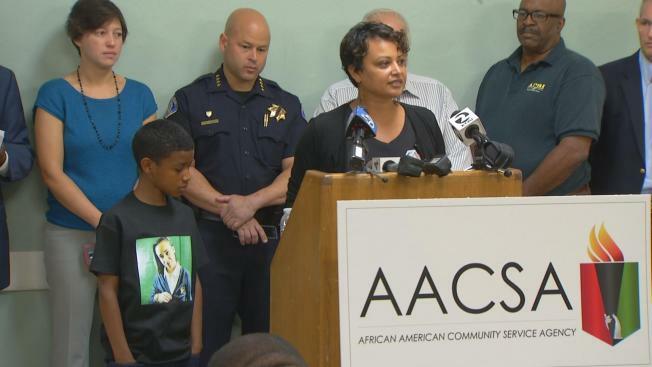 In the wake of boiling division brewing throughout the country following last week's police shootings of African-American men and the massacre in Dallas, communities of color gathered in San Jose Tuesday morning to call for healing. Social justice advocates, family members of victims lost to law enforcement violence, city council members and officers from the San Jose police force took the podium to address the nationwide tension and offer solutions. Solidarity with victims and a push for progress rang throughout the nearly hour-long discussion in San Jose. "As a country, together we must find a way forward that respects and preserves all life and where each and everyone of us is treated equally under the law," Walter Wilson, a member of the board of directors at AACSA, said during the press conference. Wilson later spoke to NBC Bay Area and highlighted the importance of corporate America and tech giants in Silicon Valley to step up and drive a movement of respect and justice. If those people with an abundance of power, including celebrities, spearhead a revolution for change, everyday citizens will listen, Wilson said. In the meantime, Wilson was adamant that the unjust killing of people of color by law enforcement needs to end. "This has to stop and justice must prevail," he said.